The Fact Table Destination loads data warehouse fact tables in a fraction of the time and with much less development work. 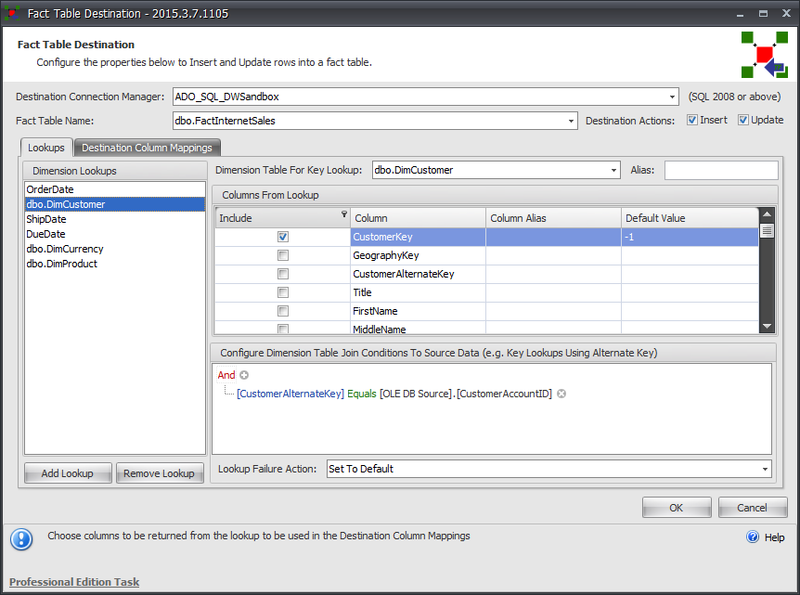 Fact Table Destination can greatly reduce development time for SSIS packages with multiple dimension lookups. With the Fact Table Destination, developers can now perform these lookups and insert data into a fact table within a single UI. Additionally, users can choose between insert and update actions for the fact table, configure table join conditions to dimension tables from their source data, create column aliases for multiple lookups on the same dimension, and define a default value to prevent NULLS from being added. Advanced features like ranged lookups are also supported. Save hours off your fact table load with this batch process.